(a) What is the terminal voltage of a large 1.54-V carbon- zinc dry cell used in a physics lab to supply 2.00 A to a circuit, if the cell’s internal resistance is $0.100 \Omega$ ? (b) How much electrical power does the cell produce? (c) What power goes to its load? This is College Physics Answers with Shaun Dychko. The EMF of the Carbon Zinc dry cell is 1.54 Volts. It supplies a current of 2 Amps and has an internal resistance of 0.1 Ohms. 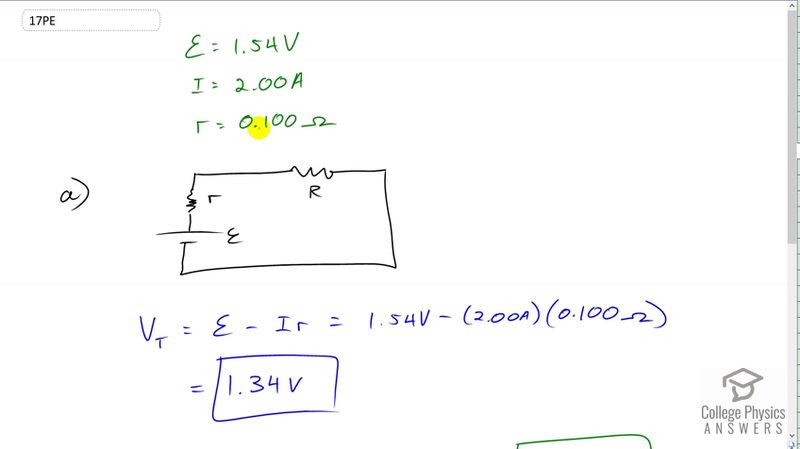 And it’s connected to some external load which will have a resistance of capital R and we’ll label the internal resistance with little r. So, the terminal voltage is the voltage between this point and this point and it’s going to be the EMF minus the current multiplied by the internal resistance. It says 1.54 Volts minus two Amps times 0.1 Ohms which is 1.34 Volts. And the power provided by this power source is going to be the current through it multiplied by its EMF and that’s going to be two Amps multiplied by 1.54 Volts which is 3.08 Watts. We also want to know what is the voltage across the load because we can use that and multiply it by the current through the load which will be the same as the current everywhere else since everything is connected in series here. And that voltage across the load will be the terminal voltage of the battery because the voltage of the battery is from here to here. But here is connected to here by a resistance-less wire. And this one is connected to there by a wire with no resistance. And so the voltage across the load is the same as the voltage across the battery. The terminal voltage otherwise. And so we have 1.34 Volts times two Amps which is 2.68 Watts.